Get ready to explore the heel of Italy! A mosaic made of small vineyards surrounded by stoned walls, scrubs of Mediterranean forests and silver olive tree gardens that surround the old manor farms, thousands of trullo houses spread in the villages. One of the most remote and least known regions of Italy, a strip of land extending into the Mediterranean Sea among castles, fishermen’s villages and towns with unique architecture; some of the most fascinating places in all Italy in a crescendo of surprises and unforgettable experiences. 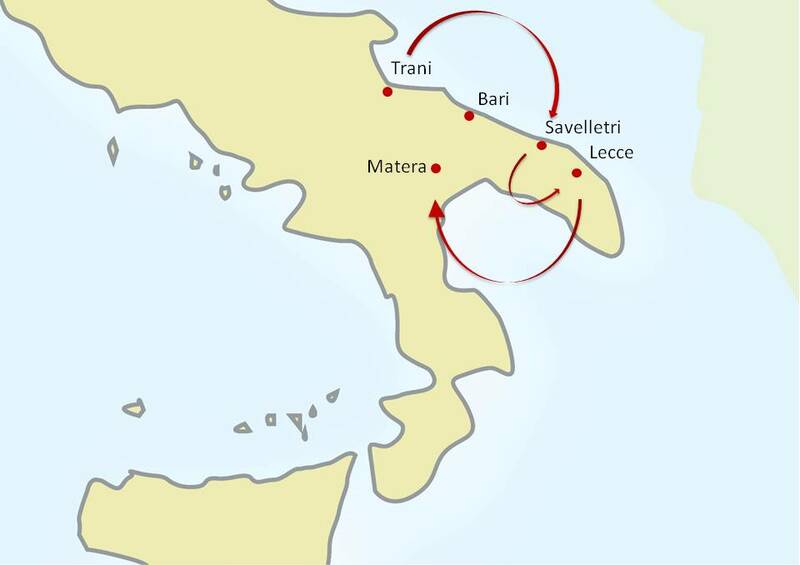 The tour features Trani, Barletta, Alberobello, Locorotondo, Savellettri, Monopoli, Fasano, Lecce, Gallipoli, Otranto, Taranto, Grottaglie and Matera. Admire the beautiful cathedral of Trani surrounded by the green Mediterranean Sea, explore the curious architecture of the houses in the towns of Alberobello and Locorotondo, discover Lecce - the Florence of Southern Italy, visit Salento with its charming seaside towns of Gallipoli and Otranto and end this unforgettable trip in Matera, Stone Town of Italy with its stunning homes built in the rock. In order to discover the real nature of Puglia & Basilicata you can’t miss some experiences related to food & wine. We have added some activities you will certainly enjoy: a typical lunch with fish freshly caught, a visit by bike to a typical Masseria in the countryside to enjoy the local products and wines, a cooking class to discover the secrets of the of Southern Italy dishes and finally a food &walk tour in the narrow streets of the Stone Town of Italy. Be among the first to discover the hidden treasure of the South of Italy! 8 Nights accommodation in exclusive and fascinating 4 sup/5 stars Hotels or historical mansions, with full buffet breakfasts: 2 Nights in Trani, 2 Nights in Savelletri di Fasano, 2 nights in Lecce and 2 nights in Matera. Private sightseeing walking Tours with expert local English speaking Guides, including the entrance fees to the sites visited: Alberobello – Lecce and Matera. 1 typical Lunch in a typical Osteria in Trani. 1 typical Lunch in a typical restaurant in Savelletri di Fasano. 1 typical dinner in a typical Trattoria in Matera. Cooking experience in a famous cooking class in Lecce. Food & wine Tour in Matera with English speaking local guide: tastings included. Full-day private bike tour (E-bike, tourist assistant included). Winery and Masseria visit included. (Tastings included). Visit Barletta on your own: admire its beautiful churches and basilicas and don’t miss the beautiful castle, the meeting point for all crusaders leaving to or arriving from the Holy Land. Then Trani, a truly medieval-style city, a crossroad of people and cultures, with its wonderful cathedral suspended between the sky and the sea. Lunch in a small local restaurant, with freshly caught fish. E-Bike tour at the sign of the archaeological discovery, an alternative way to admire the Adriatic coast by bike with professional tourist assistant and stop for visit and tasting at a typical Masseria along the way. We suggest to spend the rest of the day in Gallipoli or in the ancient town of Otranto: its narrow streets, the harbor, the Aragonese Castle; on the opposite side, facing the Ionian Sea, the picturesque maritime town of Gallipoli. We suggest not to miss the Salento region: kissed by sun and sea, and once inhabited by the people of Ancient Greece, the “Magna Grecia”. Visit Taranto, known as "The Spartan City" because it was the only colony ever founded by Sparta, in 706 BC. The village of Grottaglie deserves a visit, too. Famous for its beautiful ceramics since the middle ages, don’t miss the district of the ceramic workshops where you can purchase beautiful and unique ceramics works of art. Dinner in a typical local restaurant where you can taste the local delicacies including the famous Pane di Matera (bread).